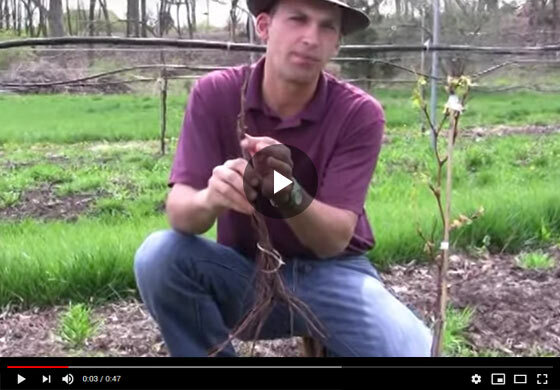 Join Gurney's horticulture expert Felix as he discusses the differences between a bare root grape and a Wow Fruit Now! Tickle Pink™ grape plant. Hi everyone, Felix here with Gurney's and today, I'd like to talk a little bit about grapes, and I want to show you also, this is our standard, bare root size. This is what you get when you buy a bare root grape. You have a nice root system and just a little bit at top, and this is going to flush new shoots this year and we'll train them up a post. You'll see all this in our video and get fruit, maybe the next year or the year after that off of your vine. All right, so here we are with our large grade first year fruiting grape plant here, and I wanted to show you the root system in this pot here. It's an open bottom pot and so when these roots make it to the base they get air root through them, and you can see here that the air exposure at the bottom just prunes those roots, and you get this nice feeder root development. So this potted grape here has a lot of power ready to go all this feeder root development. It's going to really take off quick, and in addition to that, if you look, we have also trained a cane during the growing year last year, and the benefit is that when you plant this you're actually going to get, there's going to be fruit development, all these buds on this cane, you might just encourage two or three up at the top, which we'll show you in the video how to do that and you'll actually get clusters the year of planting with this fruit grade, and it makes it a real advantage if you want to get some instant gratification. About two months after we planted our bare root grade and, as you can see, we have some nice flushes of growth, which is what you want to see but this plant is getting established, it was bare root, so it has to push out new feeder roots which are now moving along just about the same extension as the shoot growth and that's going into the soil media and then as those roots continue to get established, you'll get increased vigor and this vine will grow up along this stake we've put here and we'll get our cordon established in our curtain later this year. All right, here we are, two months after planting our Wow Fruit Now! Tickle Pink grape and you can see in broad contrasting to our bare root grade how much vigor you get right out of the gate. Just two months after planting, we have some real nice extension growth that is already going up our cane and I'll show you, we'll want to train that now, and you can also see that we have some fruit clusters developing here off of these shoots that came up off of our original trained cordon that you get in the mail when you get this plant. So you get your fruit, this will continue to develop and you get some increased vigor and quicker establishment with this grade of plant.